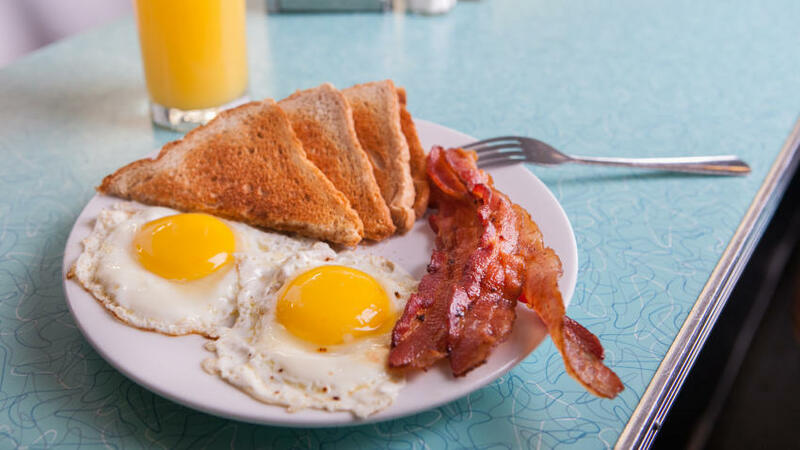 Eggs your way, bacon and toast with a side of OJ. Image: Abe Draper Photography. Breakfast is back – everyday – at Brent’s. The 70 year-old diner has announced their spring and summer schedule to include a 7 a.m. start Monday – Friday (and 8 a.m. on Saturdays). Other options include omelets any way; classics like eggs, bacon, breakfast potatoes, and fruit; and pancakes. Standouts include the chicken and waffles ($12), French Toast ($7) and the Brunch Patty Melt, topped with grilled onions, fried egg, pimento cheese, and mustard ($10). Wells cites the hard work of General Manager Sarah Friedler and her staff. “The majority of them love Brent’s as much as we do and it shows in the way they serve the community with a smile on their face,” she adds. The breakfast menu is available Monday – Friday – 7 a.m.- 10 a.m.; Saturday – 8 a.m. – 5 p.m.; and Sunday Brunch – 10 a.m. – 3 p.m..
Brent’s hours are Monday – Thursday – 7 a.m. – 5 p.m.; Friday – 7 a.m. – 8 p.m. ; Saturday – 8 a.m. – 5 p.m.; Sunday Brunch – 10 a.m. – 3 p.m.